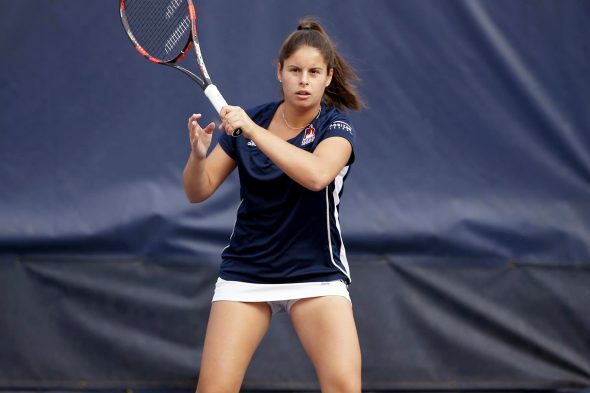 Bianca Zuzu won her singles and doubles matches Saturday. The women’s tennis team (8-6, 3-1 HL) soundly defeated Northern Kentucky (2-6, 0-2 HL) Saturday afternoon at XS Tennis. The Flames swept doubles and took four singles matches for a 5-2 win. Miranda Rodriguez and Bianca Zuzu got their first call of the dual season at No. 3, defeating Katja Dijanezevic and Hannah Watton, 6-2. Georgie Sanders and Lejla Colic improved to 8-2 on the dual season with a No. 1 victory over Taylor Culbertson and Maria Koo, 6-3. The No. 2 match between Melika LeBlanc/ Rachel Le Comber and Margita Sunjic and Sydney Power had the Flames up 5-4, but went unfinished, as UIC had already secured the doubles point. Le Comber won her fourth-straight singles match with a 6-3, 6-1 victory over Culbertson at No. 4, and Viktoria Seifert secured her sixth-straight individual victory with a 6-1, 6-4 win over Watton at No. 5. LeBlanc endured three sets with Power, and landed on top, 2-6, 6-3, 6-1, to secure the win for the Flames. Koo defeated Sanders in the No. 2 match, 6-4, 6-1. Zuzu returned to the singles lineup at No. 6, defeating Dijanezevic, 6-1, 6-4. The No. 1 match between Sunjic and Colic landed in favor of NKU, 6-4, 4-7, 10-5. The Flames will dual with Valparaiso at 10 a.m. Wednesday.